I recently had the privilege of being in attendance as my portrait was presented at a very swanky event in Detroit. 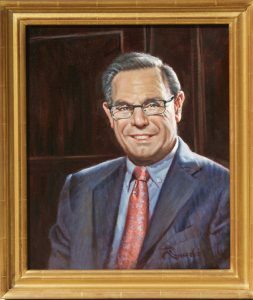 The Karmanos Cancer Institute honored their outgoing Chair with an oil portrait at their annual gala. It was well received, judging from the applause. The experience reminded me why I do this noble work. Charles Becker will be remembered by his portrait, more than by any photo or film clip. Sometimes I forget a great portrait is all about the subject. Those 600 people were applauding him, not me. The artists who forget this, are rarely successful at portraiture. That’s why its so important to research and get to know your subject. Working with Mr. Becker’s family, we made some small changes to the final work which made the portrait come to life. But that’s not the whole story. I actually created two portraits; this is something I do on occasion in order to have actual samples on hand. 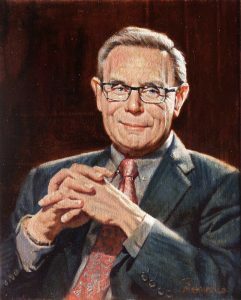 This other portrait depicted a charming, playful, quirky Chuck Becker, qualities I enjoyed very much, when I met him. But the family didn’t like it nearly as well as the other. Why? This simply was not how his family wanted him depicted. I hadn’t asked enough questions. Fortunately, I did two portraits and they had a choice. Ultimately, we came up with a final portrait that made everyone happy. Donna Tiseo Hanning liked this on Facebook. Nancy Pickover liked this on Facebook. Rozsa Dajka liked this on Facebook. Great work! I knew right away from the eyes who it was! William Pellegrino liked this on Facebook. Just like the old days when an artist spent time with a family to know them well enough to capture what they see. It’s good to see there is at least one artist out there doing things the right way. Glen Weber liked this on Facebook. Matthew Foreman liked this on Facebook. Bonnie A Kolmodin liked this on Facebook. The portraits are wonderful and the article is very helpful about portraiture a subject or growing importance to me . Why is that subject growing in importance to you, if I may ask? It’s a conversation. One I would hope to have at lunch with u guys. But it may be a while. We have an extra room if you want to stay for dinner too. We can hook you up for sure. Sue Cannon liked this on Facebook. Peter Fasi liked this on Facebook. Elizabeth Bauman liked this on Facebook. Jane Burkey liked this on Facebook. Sandra J. Booker liked this on Facebook. Photosby Vanessa liked this on Facebook.